When it comes to SmartPak, we are all about helping other riders. We offer so many ways to help fellow horse lovers, that sometimes, it can be easy to miss some awesome resources that we have that can help you! I’ve asked some of my fellow SmartPakers what the best secrets of our website are, that can help our fellow riders utilize our website to its full potential. Check out our top 10 little tips and tricks that SmartPak has, that can help you when it comes to all things horses! This one may seem simple, but this page is packed with tons of useful tools and information! When logging into your SmartPak Account, you can click on your name (for example, “Hi Olivia!”) and then click on “Your Account”. From there, the possibilities are endless! You can update your email, password, or billing information. You can also sign up for Mobile Alerts to receive text messages for when your order arrives! There are also ways to track your orders, view your order history, or update your profile – all from one spot! It’s no surprise that SmartPak is known for our awesome customer service, but we do more than just help with your account! When we say that we get you because we are you, it’s really true! All of our Product Specialists are riders and horse lovers, so we are always happy to help you. Whether it’s finding the perfect supplement for your horse, to figuring out what size saddle pad would work best with your saddle, we are just a phone call away! Don’t prefer to talk on the phone? We can be reached via email, chat, or text, too! Underneath the “Learn” tab on SmartPak’s homepage, you can access something incredible – our Ask the Vet Page! Ask the Vet is an amazing resource from our one and only Dr. Lydia Gray – she answers all of our equine questions. 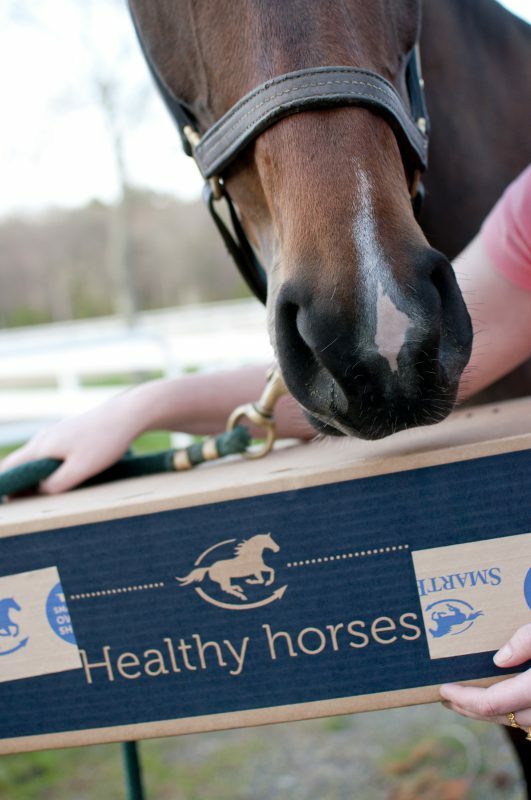 From how to build topline in a horse, to which grazing muzzle is best, this is an incredible tool to learn more about health-related issues, and to keep up to date on the world of equine health and nutrition. You can even submit your own questions to Dr. Gray. 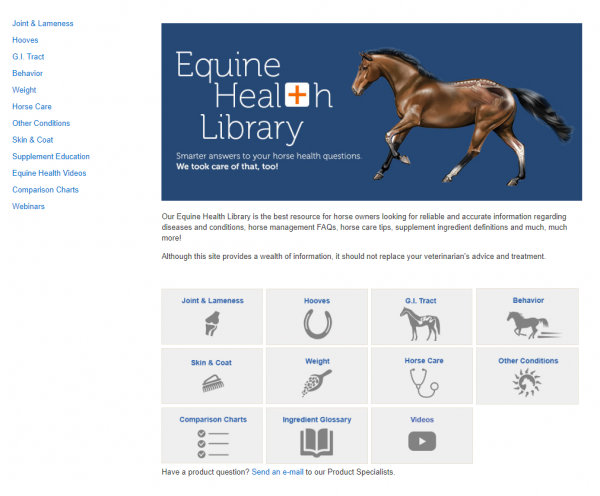 Another awesome resource under the “Learn” tab on SmartPak’s homepage, the Horse Health Library is crucial for learning all things horse health related. There are individual categories you can choose from (Joint & Lameness, Skin & Coat, etc), to learn more about each topic. My favorite part is the ingredient glossary. Have you ever seen an ingredient in a supplement that you just aren’t sure about? You can use the ingredient glossary to learn more about it, and feel confident in what you are adding to your horse’s nutrition program! Along with our Horse Healthy Library, did you know that SmartPak also has a Forum? SmartPak has helped to create a place with smart riders can help other smart riders. Underneath the “Learn” section on the website, you can click on “Forum”, which will take you to a page that offers forums for different health categories, tack topics, and little odds and ends. Plus, we also offer a free Classifieds page. You can look for a new horse, saddle, trailer, etc. on our Classifieds page. You can also search the Forum at the top of the page, if you are looking for a specific topic. If you are confused with supplement options, let the Supplement Wizard help! Underneath the “Supplement” tab on the homepage, you can access our Supplement Wizard, where you can answer a few questions about your horse and his diet, and the wizard can help guide you to some great recommendations. Our Product Specialists are also always happy to review the results with you, to see what would work best for your trusty steed! Confused about SmartPak’s Return Process? Have no fear! While we offer free return shipping on all sized items within the first 60 days of purchase, we do have a section on our webpage that can answer all your return questions. If you still need help, don’t forget that our Product Specialists are happy to assist! Finding the perfect saddle for your horse is tough. SmartPak knows that, so we offer Test Ride Saddles for almost all of our saddle options, so you can try it without worrying about a restocking fee! The process is simple: choose the test ride saddle option for the saddle you are looking at, and check out the saddle through our check out process. You will initially purchase the saddle, and from there once it is received you will have 5 business days to ride it like it’s yours! From there, you can either choose to keep the saddle, or send it back for a refund or an exchange. Be sure to keep the box and the return label! With Free Return Shipping, you can’t beat it! Did you know that SmartPak can add your logo or your barn’s logo to our system, so then you can choose it for all of your personalized orders? It’s true! There is a one-time fee of $150 for the digitization for the logo to be created and added to our system. Our SmartPakers work diligently with you to make sure it is exactly how you want it. The digitization process takes about 6 weeks to complete, and then once it is approved by you, it’s ready to go! You can contact barnlogos@smartpak.com for any logo digitization questions. Do you love our Pipers, but you’re not sure which ones would be perfect for you? Don’t worry -we have a way we can help you to find your Perfect Piper! 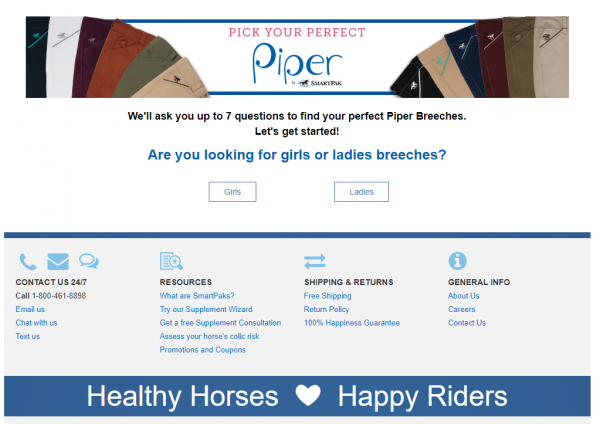 With our Piper Breeches Quiz, we ask you up to 7 questions to find your perfect pair. We are sure you will love them! Are there any SmartPak tools and resources that we missed that you just can’t live without? Feel free to comment below!